Unfortunately, the Friends of Emmet concert has been canceled due to poor ticket sales. My presentation is still on and some tickets are available. See the poster below for more details. 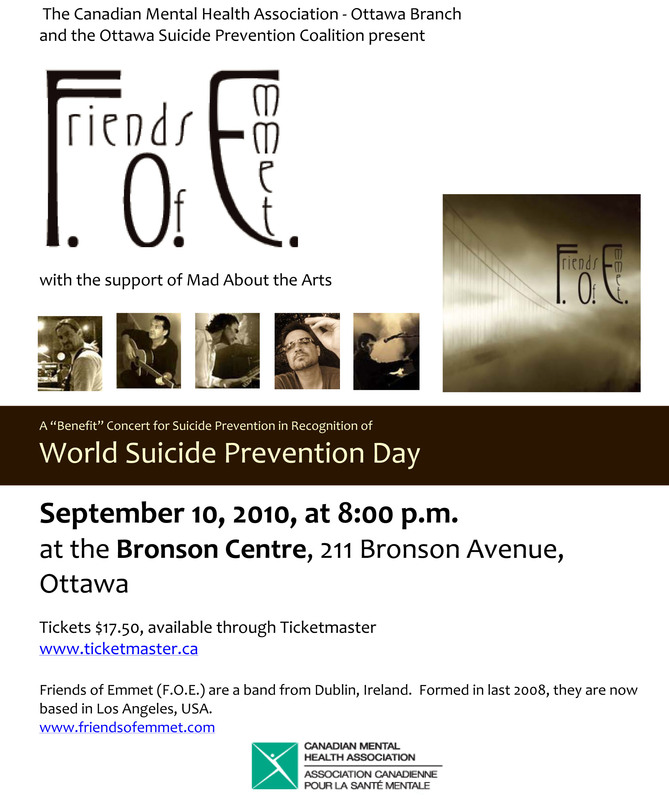 Please join Friends of Emmet at a benefit concert in Ottawa in support of suicide awareness on September 10, 2010 at The Bronson Centre. Tickets available through Ticketmaster. Tickets $17.50 each. 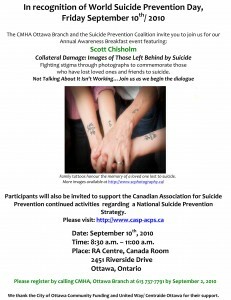 Also, I have been invited by the Canadian Mental Health Association, Ottawa Branch and the Suicide Prevention Coalition to present the Collateral Damage Project at their Annual Awareness Breakfast. My presentation will take place on the morning of September 10th. See the poster below for more information. 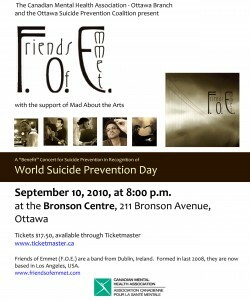 For tickets and more information please call (613) 737-7791. Please forward the link to this post to all of your friends and family in the Ottawa area. I would love to be there to hear Scott speak and meet everyone. Will let you know if I am coming. I am hoping to be there as well. I am coming for sure.